Happy new year everyone! I hope you all had a great 2017, a lovely christmas and are looking forward to a new year! I love this time of the year as it feels like a fresh new start and I get to look back on the previous year so you'll see a few favourites posts coming soon, the first is my favourite books of 2017. 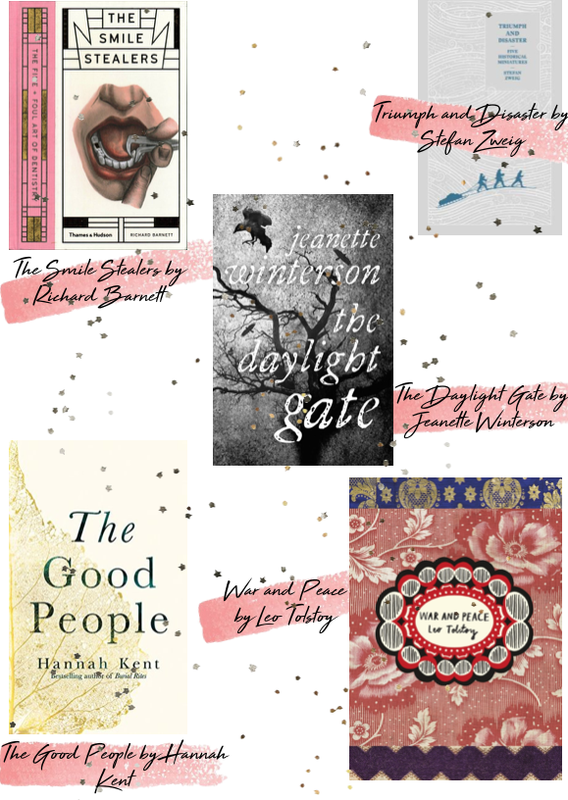 I thought that my reading year was fairly average and to an extent it was but there were some bookish rays of sunshine through the gloom and I managed to narrow down my list of 143 books that I read in 2017 down to 17 of my favourites. My favourites this year are very mixed as they include a combination of so many genres such as classics, non-fiction, literary fiction, historical fiction, YA/childrens and more. I was lucky enough to receive this book from the amazing people over at Thames and Hudson late last year and they have quickly become one of my favourite publishers as I've gone on to buy more books from them since receiving a few gorgeous books last month. The Smile Stealers is one of the most beautifully published and designed non-fiction books I've ever seen and it was such a wonderful, informative and interesting non-fiction reads of the year that I would recommend to everyone (unless you're terrified of the dentist, then perhaps not...). I don't really know how to categorise this book but I guess it could be described as dramatised non-fiction as this book contains five historical events but told by Stefan Zweig in a more personal, fictionalised way, if that makes sense. I adore the cover, it's beautifully published by Pushkin Press (another of my favourite publishers) and it was such an interesting, enjoyable and moving read that I was surprised by how much I loved. This book doesn't have the four or five stars of the previous books but I still loved it and especially Jeanette Winterson's writing and the topics of the book as well as the historical elements. Also anything related to witches is always going to be a hit for me! 2017 was the year I discovered my love of historical fiction (not period dramas or the plethora of Tudor era fiction which I'm not interested in) but more unique, quirky or darker historical fiction and this ticks most of those boxes as it involves such an atmospheric Irish village and it's superstitious inhabitants. It's definitely an emotional and dark book that I'd definitely recommend it. Now, I know that War and Peace is always on lists of books you should read before you die or classic masterpieces but I think most people have no idea what it's about besides the implications of the title but I found it SO much more enjoyable that I thought I would! From the title and my preconceived ideas of the book, I thought it would be a dusty, dry but profound book about human nature, epic battles and a baffling array of characters and it is to some extent but it is mainly a journey alongside so many wonderful, flawed and naive characters. It's a pleasure growing up with the characters, seeing their progress (or lack of in the case of Natasha) and their lives in the wide ranging scope of 19th century battle worn Russia. I know it's one of the most intimidating and demanding books out there but from someone who has never really tried or connected with classics, it is well worth the read and you will be surprised at how much your enjoying the reading process! Don't think of it as an intimidating, profound classic (as it isn't), just think of it was an epic novel, which it is. This was an e-arc from Netgalley and I adored every page! 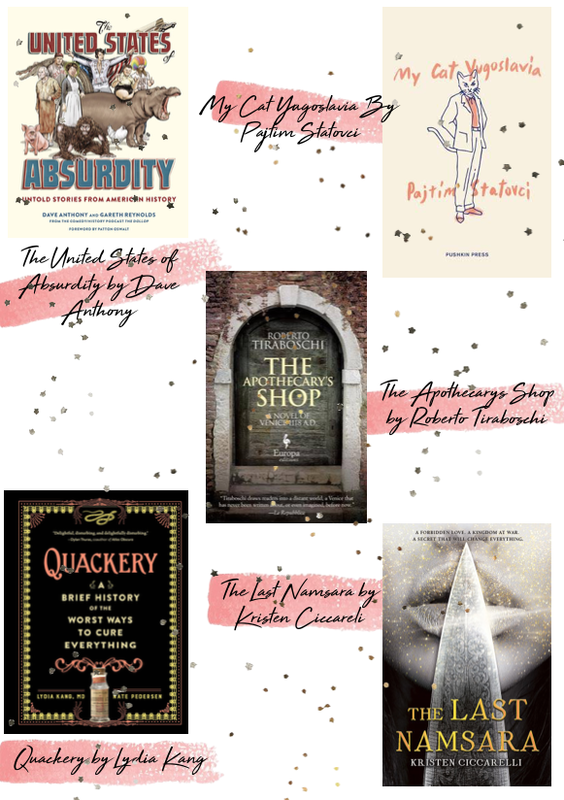 I'm not a big fan of non-fiction on the whole but one area of non-fiction that I absolutely love and cannot get enough of is quirky, unusual non-fiction and all of the non-fiction in this post fits into those categories. It is one of those books that as you're reading it, you have to tell people about what you've just read as it was shocking, funny or interesting. I was kindly sent this beautiful book from Pushkin Press (three of their books have made it into this post) and even though it's a very unusual book with elements of magical realism, literary fiction and heavy topics such as immigration, assault, LGBT topics and conflict. It was an interesting, absorbing and emotionally draining book with lighter elements and devastatingly real characters. I'd definitely recommend it, particularly as the cover is just so gorgeous! Now onto my final quirky non-fiction favourite of 2017 and it's one I'd recommend to everyone! I loved the layout of the book and it was such an interesting, shocking and informative read all about the medical mistakes, blunders or strange thinking that has occurred over the centuries. One of my favourite topics within history is medical history so this book did have a fair amount of information that I already knew but there was so much that I didn't as well. I think it would be a read non-fiction read for those interested in the topic and those who don't read that much as you can easily dip in and out of it. I think I'd going to buy it for my grandad as I know he'd find it interesting too! This is the only YA book on my favourites list (I think, maybe a couple of others could kind of be categorised as YA or new adult) and it was wonderfully enjoyable. As well as my buzzword of 'witches', 'dragons' is also one of my buzzwords so I already knew I was going to like this book. It was so entertaining, absorbing and it had so many elements that I love in a YA fantasy read - it was also one of the quickest reads of the year despite it being a little on the longer side as I couldn't put it down. I believe that this is a classic American childrens book but I'm not sure; whatever it is categorised as, I loved it! It is a wonderful, interesting and fairly unique halloween story that I read in March...because that makes sense. I love the cover, it's a super quick read and it introduced me to Ray Bradbury who is now one of my favourite authors as his writing is just so exquisite! Horror isn't a genre that I usually go for but I heard so many amazing things about this book so I had to read it! I loved this book for it's unusual plot, interesting mystery and the suspenseful, horror elements. It definitely had me a little scared if I'm honest and I'll be on the look out for more of his books in the future. How gorgeous is this cover! I've wanted to read this book since it was released and I finally did at the end of the year. It's such a unique, interesting mystery with a lovely cast of characters and a very sweet teenage romance that thankfully isn't the main story but I'm glad it was there. I liked the writing style, the mystery around the disappearances and the magical realism elements! The only thing I didn't like was the tiny font! When taking about beautiful books, I had to mention The Nutcracker as it doesn't just contain a lovely Christmas story but it is beautifully published by Thames and Hudson; however this best thing as to be the amazing, intricate papercut pages. Speaking of festive reads, one of the best is definitely Hogfather by Terry Pratchett which is the fourth book in the death series which is part of Terry Pratchett's huge Discworld series - you have to read the other books in the death series before this one! It is definitely my favourite Terry Pratchett book so far as it's festive, whimsical, wonderful and darkly comic. Terry Pratchett is one of my favourite authors so I can't wait to read more of his books in 2018. Oh, this book! It was one of the best books of the year as it not only has a fantastic, heart wrenching story that is filled with emotion but it's also a very real look at events that are happening all over the world. I loved his writing, the characters and story will stay with me for a while and I think it's a very important but interesting book that everyone needs to read. I discovered another favourite author this year, Karen Maitland. I received this book via BookBridgr and even though it's a little longer than the books I typically read at 562 pages, it's darkly entertaining from the very beginning to the very end. I loved the Game Of Thrones type world (albeit a microcosm of it) as well as the vivid characters, requited love, mystery and dark themes. I have already bought more of her books to read throughout 2018. 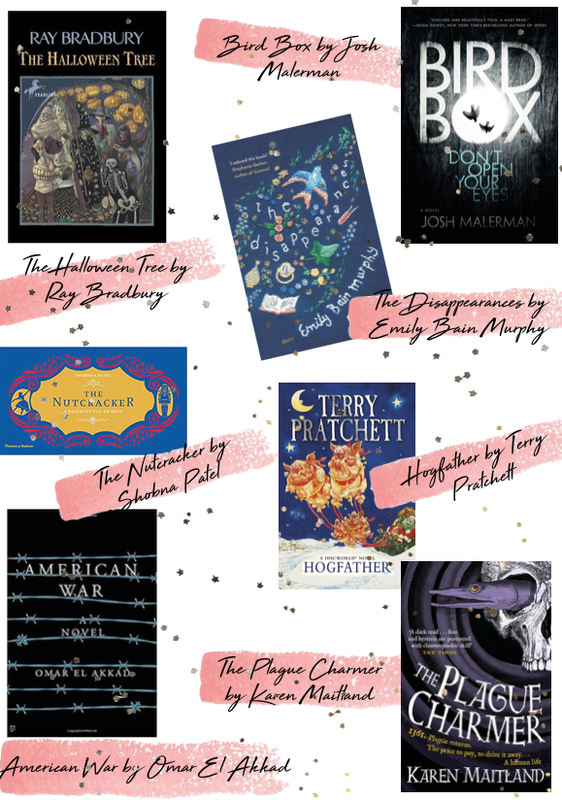 I couldn't just choose seventeen books for my top favourites, I had to pick some of my honourable mentions to include as I don't want to leave any of my favourites out of this post even if they didn't quite make the final cut! While writing this post, I realised that I actually read quite a lot of fantastic books in 2017 even though it doesn't seem that way just looking through my GoodReads. I discovered some fantastic books this year, whether they are standalone books or as part of a series as well as some of my new favourite authors including: Vic James, V.E Schwab, Karen Maitland, Theodore Brun, Jeff Vandermeer and Josh Malerman among others. You'll see my favourite audiobooks (via BookBeat) very soon. Don't forget to follow me on GoodReads to see what I'm reading, reviews and my ratings! What were your favourite books of 2017? Have you read any of my favourites? I definitely want to try and get back into reading this year! You got through quite a few books! The Hogfather is great isn't it! I love your new style of photos! love this post, keeping it as a reference when I need a new book. Hogfather by Terry Pratchett is absolutely brilliant! Loved it! I will definitely pin this for later as my birthday is coming up & I've been looking for a few new books to treat myself too. So many fab recommendations! I'm definitely going to check some out!